Since competitive ballroom or Dancesport, standardised ballroom styles and levels, the term ‘ballroom dance’ is often used in reference to the five dances which make up the International Standard ballroom category. (Other categories include International Latin, Latin Swing, and in the U.S., American Smooth and American Rhythm.) The five International Standard dances are Viennese Waltz, Waltz, Tango, Slow Foxtrot and Quickstep. Danced at about 180 beats per minute, the Viennese Waltz sends its dancers gliding swiftly across the floor in 3/4 time. The earliest form of the waltz, in fact the oldest ballroom dance of all, the Viennese Waltz is a ‘rotary’ dance, or one in which the dancers are constantly turning either clockwise or anti-clockwise as they circle the floor. They use ‘change steps’ to alter the direction of the turns. A true Viennese Waltz consists only of turns and change steps. However, additional steps such as fleckerls, pivots, and underarm turns became incorporated later and are now allowed when the dance is done competitively. Once called the ‘slow waltz’ or the English Waltz, this is a later version of the Viennese Waltz and is danced at around 90 beats per minute. Although it is much slower in tempo, dancers doing the Waltz sometimes step in 4/6 time, taking two steps per beat and add turns, slow steps, and poses to make the dance more dynamic. This is often the first dance performed at Dancesport competitions. Its technique calls for a ‘pendulum swing’ of the body, parallelism of the feet, sway, contra body motion and rise and fall. Having originated in Argentina and Uruguay, the tango is a dramatic and romantic dance in which dancers remain closely interlocked and move with passion and precision. The tango is generally danced to modern music at about 120 beats per minute and in 4/4 time. ‘Ballroom Tango’ is actually a simplified version of the original Argentine Tango. 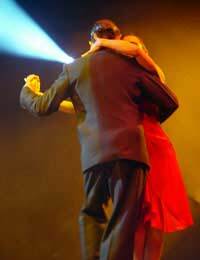 Unlike Argentine Tango, Ballroom Tango requires that steps stay close to the ground. Many of the steps that are typical to Argentine Tango, such as the boleo (swinging a leg into the air) or the gancho (wrapping a leg around the partner’s body), are not used in ballroom. There are more staccato movements, however, that are specific to Ballroom Tango, such as the ‘head snap’. The Foxtrot was invented by vaudeville actor Harry Fox. It was originally danced to Ragtime music but is often danced today to big band music. The basic Foxtrot rhythm is slow-slow-quick-quick. It’s a graceful and fluid dance with a pace of around 120 beats per minute in 4/4 time. Weight change and sway is particularly important in the dance, since it relies upon a good deal of back and forth movement. The Quickstep is like a fast Foxtrot and also shows influences from dances like the One Step, the Charleston and the Shag. Originating in England in the 1920s, the Quickstep is done in 2/4 or 4/4 time and is an energetic dance with a great deal of momentum. Though the dance should appear smooth and graceful, it often consists of a series of hops, runs and rotations. The sequences or patterns used in the Quickstep might last for several bars of music, which results in the speed and fluidity with which a couple should move across the floor. Though each of these dances follows a unique set of guidelines, there are a few qualities which they share. First, like all Dancesport dances, they are performed by a couple, usually a male and a female. Secondly, all five dances are performed in the ‘closed hold’ position. This means that the couple should maintain five specific points of contact for most of the dance. Also, all five dances require a high level of precision and concentration, as they rely heavily upon technique. In light of their differences, however, dancers who set out to master all of the five standard dances are in for an exciting challenge, as each requires a unique dynamic and a fresh set of skills!